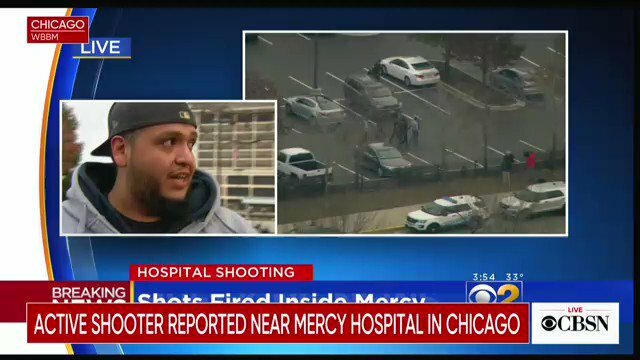 Thread by @AdamParkhomenko: "Rosie O’Donnell, Broadway stars to stage musical protest outside Kremlin Annex chicago.suntimes.com/entertainment/… Monday at the Kremlin An […]"
"I turned around to my right and I see a man shooting someone on the ground": A man who was waiting for results in #Chicago's #Mercy Hospital describes seeing the active shooter there. Dana Owens was born in Newark, NJ to policeman Lancelot and schoolteacher Rita Owens. Her family was very close-knit and she was raised with music ever-present in her home. Her parents encouraged her extroverted tendencies while trying to discipline her rambunctious tendencies. Dana’s stable family life was shaken when her parents divorced when she was ten. Her father was still close by and a prominent part of his kids’ lives, but Rita moved Lance and Dana into housing projects on the other side of Newark. 1) @Rosie O'Donnell introduces 55 Broadway singers at the #KremlinAnnex White House protests on Aug 6, 2018. Monday night Aug 6 at 7pm, @Rosie O’Donnell is bringing a TON of Broadway stars to a singing protest at the Kremlin Annex, right on Pennsylvania Avenue, north of the White House. It’s free Rosie and free Broadway stars, who could ask for anything more? Tonight @ 7pm, @Rosie O’Donnell and Broadway’s finest protest Trump with song at the #KremlinAnnex in DC. Join us on Pennsylvania Ave, just north of the White House and south of Lafayette Park. Gonna be fun. Want to tick of Trump AND Putin? Show up at the White House tonight (Monday Aug 6) at 7pm when @Rosie O’Donnell and Broadway’s finest protest in song at Day 22 of our ongoing #KremlinAnnex protests just north of the White House, south of Lafayette Park. 1) The details of our #KremlinAnnex “@Rosie goes Broadway” protest are out. And it’s gonna be a doozie this coming Monday at 7pm just north of the White House. 2) The group will sing “The People’s Song” from “Les Miserables,” Burt Bacharach’s “What the World Needs Now Is Love,” ”A Brand New Day” from “The Wiz” and “Climb Ev’ry Mountain” from “The Sound of Music” from Lafayette Park.